Lighthouse "West Schouwen" or "Westerlichttoren"
The West Schouwen or Westerlicht tower is a well-known lighthouse in Haamstede. The tower was designed by L. Valk and built in 1837. With its 53 meters height (above the ground level) and a light height of 58 meters above sea level, the tower is one of the highest lighthouses in the Netherlands. The base of the tower is formed by approximately 2.5 meters thick walls, which become thinner towards the top. It is painted with a red and a white band that run up in a spiral. A partly stone and partly iron staircase of 226 steps leads to the top. The tower is no longer manned. The radar image is forwarded to the Kustwachtpost Ouddorp. The lighthouse is not accessible to the public. The lighting is switched on and off automatically by means of a light sensor, as has been the case for many years. The seaman recognizes the lighthouse by the character of light (group flash 2 + 1). The lens system, which provides the character, was installed in 1953. After the light source was initially a light bulb of 4200 watts, this is now a gas discharge lamp with a power of 2000 watts. 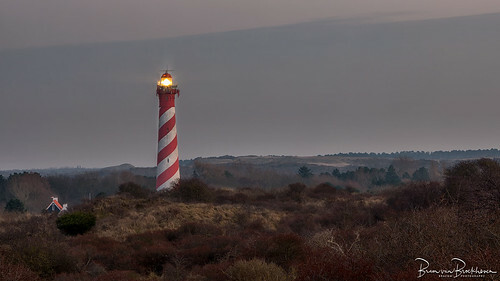 This lighthouse is also known for the fact that graphic artist Oxenaar used his image on the banknote of 250 guilders (Picture), which became known as "the lighthouse". Thanks for your visit and comments, I appreciate that very much! Please don't use this image on websites, blogs or other media without my explicit permission. © all rights reserved.